Size: 896 sq. 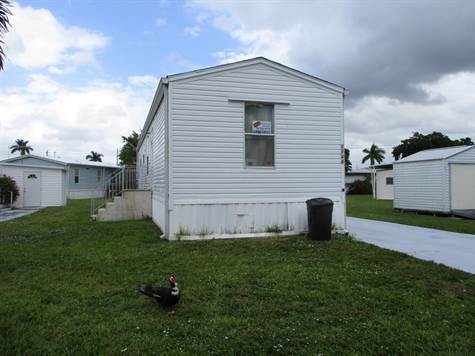 ft. "Big Singlewide 64' x 14' Manufactured Home"
Year Built: 2005 "Newer Home!" 3 Bedrooms and 1 bathroom. Laminated floors throughout. Double Windows, Big Water Heater, Central A/C and 5 Ceiling fans. Roof is in good condition. Located in a 55+ Community with 24 hour manned gated security, luxurious heated swimming pool, newly renovated clubhouse, laundry, shuffleboard, putting, petanque and more.